There's no down time for the crew of the Andromeda Ascendant, even when taking some well-earned R&R, in this sixth book-length adventure based on the popular Gene Roddenberry television series. Shortly after being lured to the Paradise Drift recreational asteroid, Commander Dylan Hunt and his team find themselves ensnared in individual intrigues hidden among its amusements: Capt. 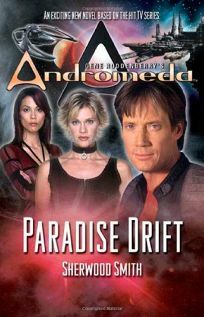 Beka Valentine is being stalked by a bounty hunter skilled at blending in with the Drift's many attractions; irrepressibly promiscuous engineer Harper is poisoned by a former lover who tells him the antidote can only be found back on Earth; and Dylan discovers his ship is being targeted for takeover by an approaching Nietzschean warfleet. The multiple subplots keep the action brisk and allow Smith (Inda) to indulge in plenty of space opera pyrotechnics. Fans of the show will find this a perfect between-episodes time-bider.